Arab teenager disrupts Civil Administration work on infrastructure, becomes violent when police intervene. 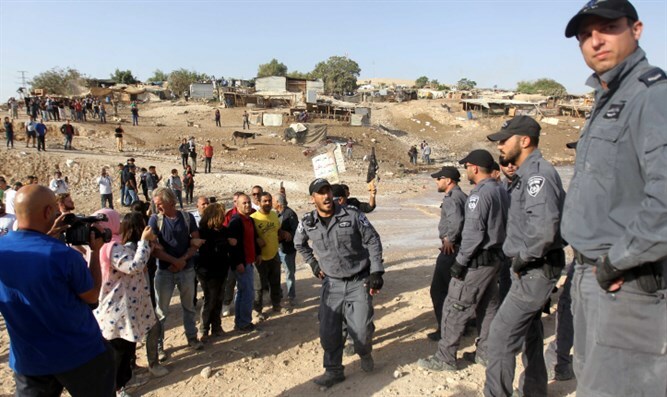 Civil Administration employees were accosted by an Arab teenager while carrying out work on infrastructure near the illegal Bedouin village of Khan al-Ahmar. In order to carry out the work, engineering tools were installed in the compound to dry a water reservoir that was damaged by a pipe that conveyed water. During the course of the work police arrested a 19 year old Arab woman who attempted to disrupt the work. She attacked the police at the scene and spat at them. Then police units spotted 3 vehicles that entered the site through dirt roads & the vehicles were confiscated. The Israel Police warned that any attempt to reach the Khan al-Ahmar area with four by four vehicles will be prevented by police and the vehicles will be stopped at the scene. Last month, the Supreme Court rejected the final appeal against the demolition of Khan al-Ahmar.